Sally Sherman, who “retired” as deputy Flagler County administrator on Feb. 28–but not really–was “rehired” under her previous title starting Oct. 1. Sherman never left the job. She clocked out as a county employee on Feb. 28 but returned to work the next day to her same desk, her same office, email account and phone extensions, and largely the same responsibilities. But to skirt state law that required employees like her to leave the government job they’d previously held, she returned under the pretense of a “consultant” employed by a private employment agency called JMI Solutions. The county contracted with that company for Sherman’s services (as it has for other temporary employees). Thus, Sherman was able to continue working for Flagler, albeit at a much higher rate of pay and cost to county taxpayers, who were footing the bill either way. Sherman left the job on Feb. 28 making $136,468. The next working day, she was making $149,000 a year (if her salary were annualized) and the county was paying JMI solution an additional $41,000 “mark-up rate” to employ her, for a total weekly cost to the county of $3,661 (or an annualized cost of $190,372). The arrangement lasted seven months, and after FlaglerLive revealed it in a pair of stories in June, the contract with JMI was renegotiated in July, eliminating JMI’s mark-up and bringing down the weekly cost to $3,019. Since Sherman is being “re-hired” as a county employee on Oct. 1, she will have worked as a consultant for seven months. The actual cost to the county: $99,111. The release also stated that “Sherman’s take-home pay from the consultant was slightly more” than her previous county salary–an odd way of referring to a $12,500 pay increase. The release justified the higher pay because Sherman was having to pay her own benefits, “a net loss in total compensation of about $20,000.” But that was yet another inaccuracy: Sherman’s “total compensation” now includes her taxpayer-supported retirement pay of $68,172 a year, making her total compensation when she was a consultant $217,000 a year. Her current total annual compensation is $215,000–$136,468 in county pay, $10,500 in health benefits, and $68,172 in retirement pay. The county press release on Wednesday was unusual. It was issued as FlaglerLive was requesting records about Sherman’s re-hiring, signaling to the administration that a story was in the works. “We knew you were going to fry us,” Coffey told FlaglerLive. So the announcement of Sherman’s hire was speeded up in an attempt to beat the FlaglerLive story with the county’s brightly pre-emptive perspective. Its inaccuracies aside, the release was unusual also for its purple style and lavish praise of Sherman, using phrasing and hagiography more commonly associated with the introduction of a presidential candidate at a party convention than with a government employee in a position that doesn’t commonly warrant the attention of the agency’s PR office: “Sherman’s story before entering the public sector is nothing short of amazing,” the release stated. “Her strong work ethic harkens back to her humble roots as one of 13 children of migrant family.” And: “While she may not think of herself as a role model, she is indeed a role model for anyone who believes professionalism, hard work, and ethics are a path for success,” the latter a quote by Commissioner Charlie Ericksen. Defensive, because the revelations of the county’s end-run in June provoked a strongly critical reaction, not least from some commissioners. While all commissioners had been made aware of Sherman being rehired as a “consultant,” none was aware of the dollar figures behind the arrangement. Still, a majority of commissioners defended the contractual hire–and are defending her re-hire. “Coffey told me that now that the time limit is up for Sally, that he’s going to go ahead and advertise the position,” Sullivan said. The county had purposely sat on the position by not advertising it for six months, saving it for Sherman. 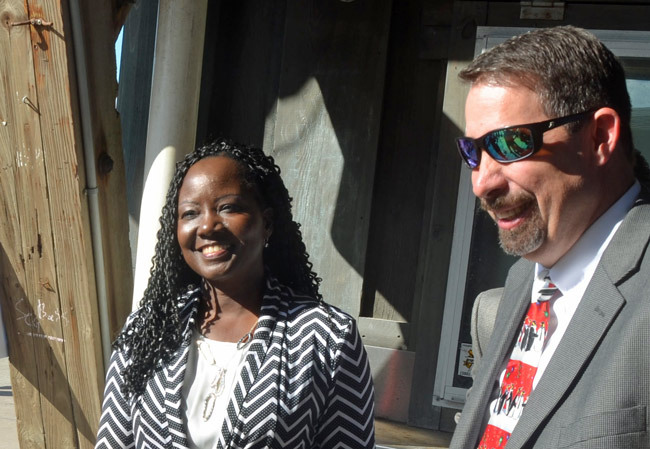 Aside from her, four people applied: Lyndon Bonner, the former Bunnell city manager who was a recent and unsuccessful applicant for the manager’s position there, Douglas Bentley of Palm Coast, Dianne Huges of Stuart and Diana Seydlorsky of Jacksonville. Sherman is not Flagler-based: her home is in Lake Mary. The resume she submitted did not mention working for Flagler County from March to the present, but rather listed her job as “senior special projects coordinator/consultant” for JMI Solutions, and described her job this way: “Providing government services in project management and mitigating risk while optimizing operations. Services include: drafting various policies, editing codes and operational procedures for consideration, assisting in human resource needs and staffing support.” The resume then provides “highlights” of her job achievements, again not mentioning Flagler. Only when the resume jumps to the period between September 2008 and February 2018 does it refer to her job as deputy county administrator in Flagler. Her letters of recommendations included only one current letter–from County Engineer Faith Alkhatib–with all other letters culled from 2008 and before. He said Alkhatib had been offered a job in Daytona Beach a few months ago, at a $150,000 salary. He didn’t want to lose her, prompting a change in her job category’s salary range (to up to $155,000 a year), which the county commission approved, thus enabling Alkhatib’s current salary of $150,000, plus a $5,000 car allowance. Sherman is being re-hired at her previous salary of $136,468, but she is in line for the automatic 3 percent cost-of-living, across-the-board raise that kicks in on Oct. 1, raising her salary by $4,000, to just over $140,000. She may be in line for further raises as the county commission gave the go-ahead to the administration to raise salaries in line with a new study, showing many county employees to be underpaid, compared to their peers in other counties or cities. But Sherman’s current salary is already $10,000 higher than the mid-point salary of deputy administrators, according to the salary study. State law required Sherman to leave her job because she had elected to be in the Florida Retirement System’s Deferred Retirement Option program. The program allows participants who have elected to retire to continue working for four years while their retirement benefits accrue and collect interest. But at the end of the four years, they are required–by law–to stop working in any government agency that’s part of the Florida Retirement System, though they may work elsewhere. They may then either take the retirement funds they’ve accrued or have them paid to them in installments. The prohibition on FRS-related jobs is for six months. Sherman was in Drop. She “retired” on Feb. 28. She collected a one-time $330,148 retirement payment, and started collecting a recurring, monthly retirement check of $5,681, or $68,172 a year, which she is still collecting. If she were following the spirit and the letter of the law, Sherman would have had to leave her job at the county in earnest. She and Coffey only followed the letter of the law. By taking advantage of a loophole in the law and returning as a “consultant,” she was technically not a county employee, though she was violating the purpose of the retirement program, designed in part to provide government employees a comfortable retirement, but also to provide government agencies a means to prepare for succession and allow new blood to course through an organization. Coffey said there is “merit” to that approach, but stressed the invaluable experience Sherman ensured. You raise my taxes and this is what you spend it on. Money isn’t spent on police, fire, roads or improvements to water. Money is spent on websites, raises and hiding the truth. I have been a vocal critic of Dennis McDonald, but call me crazy, he is making a lot more sense these days. It’s unconscionable to think that the tax payer Coffey pot is a slush fund for your friends. If theee county commissioners want to be re-elected they will do the right thing by the voters and Fire Coffey and Coffey mate. Otherwise it’s time to vote for Dennis McDonald! Residents of Palm Coast……… wake up !! Sally Sherman and Craig Coffey are laughing at all of us. They have pulled one of the slickest moves ever and it looks like they will get away with it. I’m curious as to whether the State can get involved since she is collecting retirement. Why should the State pay for her retirement when she is working full time. By the way we can stop this stuff from happening. How? Vote in November and get us Commissioners who have back bone and will stand up to Coffey. Or maybe just get rid of him finally. Very shady Coffee. I can’t imagine any county job requiring a years training……including yours. Why is JMI Solutions not listed on sunbiz.org.???? Are they real?? Not only was this taking advantage of a loophole; it was deceitful to the citizens of Flagler County. Whatever happened to “ethics?” Coffey is directly responsible for the overpayment of wages to accomplish the same level of work. His actions show weak management skill. He had 4 years to plan for her retirement. No one is “or should be made think they are” indespensibke. Four years is three years longer than what it should take to bring a qualified individual onboard and ready to step into Sherman’s position. What would Coffey have done if Sherman had become unable to fulfill her responsibilities or if she had left her employ to accept another position out of the area? Has he not heard of backup or cross training of staff members? It would appear to me that Mr Coffey lacks some basic management skills and practices. Seems to be a lot of that here in Flagler and Palm Coast Administration. I strongly urge you to take the time to read the following, as it is quite the elaboration of how and why this entire situation is totally wrong. Although I am not an FRS “expert,” as someone who is actively participating in FRS and finds this entire charade to be insulting and quite frankly, disturbing to the ethics and laws of which have been egregiously violated here.. let me explain to everyone for the record, why in fact Ms. Sherman’s rehiring is grossly illegal and will eventually cost county taxpayers even more money once the State investigates. To begin, I intend to make three primary points with sufficient language from Florida Statutes to support this claim. I hope this as educational for the public as it will be for those in County Administration. In order to understand the modern scheme of “double-dipping” we have to look to the most recent examples of it. Is it not ironic that they were paid an egregious fee for “finding” an employee who was already employed by the same agency? You may wonder how this skirts the State procurement and contracting laws and limits? The loophole therein lies with the “professional services” nature of the “search” for an employee. Florida Law provides exemptions from procurement and bid-based contracts for such services (with limitations). See a Chapter 287 F.S. But back to the main point. The police chief in Coconut Creek left his position for 6 months and was promptly rehired after that time. The position went purposefully unfilled for that period of time so that the city could hire him back and no one else. Although highly unethical and against the spirit of the law change in 2010 that increased the period (from 1 month to 6 months) between collecting retirement and being rehired by an FRS employer – the action was still legal. In Flagler County’s case, Sherman immediately reported back to work the following week under the guise of a “consultant” status. That tricky “loophole” would work if not for one important detail about the Department of Revenue and FRS – in order to be a credible “consultant,” you can’t have your entire personal operation be dependent on public resources or the overhead of the employing agency. In layman’s terms, you have to provide your own work space, working materials, like-contracts and business, and generally assume the same risks that any business owner would make with operations and overhead. In the case of Ms. Sherman, not only did she return to work immediately for Flagler County, but she did so by utilizing ALL county resources including work space and materials, AND she acted in her “deputy” capacity with almost the same authorities she did as the official deputy administrator. I dare you to ask any employee of the County – they will attest to these truths. Thus, even if you could not provide that Ms. Sherman acted in her authoritative duties following collection of retirement benefits, she at the very least, acted in a 100% employee capacity for Flagler County. Sally Sherman FAILED to terminate ALL of her employment with Flagler County. Her hiring as a “consultant” would certainly be found to be far removed from the definitions and standards held by the DOR and state investigators. There are other examples in state statute that further elaborate on this understanding. And to further prove the point with case evidence, an individual in another city in south Florida who had 16 years of employment service with the city, but an additional 14 years as a consultant, was recently notified by the state through FRS that he had reached his 30 year contribution. The state held that although he operated those additional 14 years as a “consultant” that because he worked in an office within the city, with city materials and resources, and in the full overhead and capital investments of the city (not his own risks), the city was forced to suddenly pay-back those 14 years worth of retirement benefits to the state in one lump sum. If FRS were to hold equitable, these nearly identical circumstances – Flagler County and Ms. Sherman are very much in deep water with the State. I do not see it as my duty to investigate such matters, nor do I hold that I have sufficient legal expertise or jurisprudence to make such rulings. I’m an analyst and that is what I do best. With that said, it does not take a genius to look at the facts, evidence, and case history to see that state law here was very much violated by both Ms. Sherman and the County. If there be legal justification or proof otherwise, I challenge someone to present such for the purpose of this public forum. I will conclude my statements by noting the inherent irony… it was the arrogance of both county administration and Ms. Sherman that goose-stepped themselves into this legal and ethical mess. If Ms. Sherman had simply not been so greedy, had been patient enough to wait 6 months, and allowed the county to simply ignore filling the position for that time (it did anyway), no laws would have been violated. It was actually their actions of circumventing the process by rehiring Ms. Sherman immediately as a “consultant” that was the nail in the coffin. I strongly urge and suggest that County Commissioners investigate on behalf of county taxpayers. Call the Department of Revenue or dare I say, Attorney General for an opinion. You may not like what they have to say. It’s just about a friend looking out for a friend on the County tax payers dime , shameless and a flagrant disrespect to us all. Beyond reprehensible. Present Flagler County voter count that helps define the load of local government stands at 81,138 total for all of Flagler County with 61,921 in Palm Coast, 4,725 in the Beaches and 1,646 in Bunnell. The County Board of Commissioners need to fire Coffey immediately and start being held accountable for his bloated ego, lack of leadership blatant misuse of authority to the Board and 12, 846 citizens the County represents. The Sherman deal wreaks of political patronage, her so-called experience and contributions to the county do not merit the compensation and continued pay-outs from our tax dollars. Somebody please put and end to this insanity and in your face nepotism. Now that’s leadership. Let’s see how we can game the system to our advantage and screw the taxpayers at the same time. That must be those special skills his “all stars” possess. Glad to be out of here soon. What are they up to when there is no paper trail? Seriously?? And then they wonder why taxpayers are upset. Time for the Coffey Klatch to go. Look at what the “ptivate employment agency” lists for jobs. Low level ones that can easily be posted online. Everybody smiling,and why wouldn’t there making bank. Whats wrong with this picture. COFFEY. HE needs to be fired. Beyond reprehensible. Mullins and McDonald need our support at election time if Coffey is not fired immediately by the current stooges. Present Flagler County voter count that helps define the load of local government stands at 81,138 total for all of Flagler County with 61,921 in Palm Coast, 4,725 in the Beaches and 1,646 in Bunnell. That leaves only 12,846 voters in the unincorporated County or less than 16%….Roughly three quarters of Flagler County is governed by the City of Palm Coast. The City of Palm Coast sewer and water utility services not only serve the city but also areas outside the City limits. The County Board of Commissioners needs to fire Coffey immediately and start being held accountable for his bloated ego, lack of leadership blatant misuse of authority to the Board and 12, 846 citizens the County represents. The Sherman deal wreaks of political patronage, her so-called experience and contributions to the county do not merit the compensation and continued pay-outs from our tax dollars. Somebody please put and end to this insanity and in your face nepotism. Coffey was hired is 2007. The Board has never said no regarding his pay requests and guaranteed 3% yearly raise. THIS information goes back to 2014….. Time for this insanity to stop when Flagler County only represents 12,846 voters in the unincorporated County. Flagler County Administrator Craig Coffey is asking for a 10 percent raise which, if granted, would raise his base salary from $146,383 to $161,000, making him the second-highest paid public employee in the county after Palm Coast City Manager Jim Landon, whose base salary is a few thousand dollars higher. The raise would be the steepest granted any local government executive since the Great Recession. Coffey’s contract will automatically renew through 2019 if the county commission does not communicate to him in writing, by Oct. 23, 2015, that it does not choose to renew. Coffey’s raise would be in addition to the raises he’s received in the past two years, as his contract calls for him being automatically awarded the same percentage increases that county employees receive. Since July 2012, for example, when the county commission agreed to Coffey’s request that his contract be extended to 2016, his salary has increased $5,000, or 3.5 percent. He also receives a $4,800 car allowance plus mileage and expenses. It happens more than you might realize… Bob Wallace (FHCP new principal) retired in Volusia county as the highest paid administrator in the county School system,, sat his required year out playing golf, then returned to work at Atlantic HS, and this Fall skipped over to FPHC to be FHCP new principal.. “Legally” Collecting both salary and fat retirement $$$$ from Flagler Schools & FRS. Just saying. Are you kidding me. Coffey needs to be investigated! The only way We The People can do anything is to get in touch with our Flagler County Representative Ron DeSantis, 386-302-0471, this is his palm coast office. Tell him to read this article and tell him what has and is going on with Coffey and the other situations like the purchase of bad properties etc. and tell him our Commissioners are not working in the Your best interest.We all have to make an appointment-with DeSantis. Call him first. When oh WHEN are the people of Flagler County going to WAKE UP and pull their heads out of the sand (or wherever their heads are) and do something about Coffey and his entourage??? For pity’s sake people, WAKE UP! Wake up Commissioners do the right thing for Flagler take a lesson from PC Council. ATTENTION.The county needs a forensic audit. Call Hutson 446-7610, Remner 386-446-7644 and DeSantis, 386-302-0471 attention immediately. Like State Rep. Renner did for the mosquito control. Too late. DeSantis resigned to run for Governor. Totally disgusting how this was done. Also how does the county commissioners NOT know this was going on answer they DID and dint care. Just shows Coffey and the commissioners only care about themselves not the public or the rank and file workers who are grossly underpaid and will see less the $20 bucks a week raise after nearly 10 years of NO pay increase just $ being taken out of their pay checks. Wake up commissioners do whats RIGHT unlike Coffey and Sherman. Fire both the losers. They will not be missed, and put the money toward improving drainage in this crooked town. I wish the Governor would step in, and burst the bubble these fools live in. Can this county, city and state get any more corrupt. Taxpayers sure pay the price. Guess it is time to move. Time for a change – not sure where you got the idea that the Flagler County Board of Commissioners only represents the residents of unincorporated county areas. they represent ALL county residents, although they affect some residents’ lives more than others depending on where we live. Our elected officials and management personnel must ensure our tax dollars are wisely spent. As a resident and business owner I am very concerned about wastage in our local government. Its easy to spend other people”s money. When is the people going to wake up? What’s Sally got on the county commissioner and coffe to rip us off? BOCC fire Coffey please and Sherman too…is the last thing you can do before you will see the writing in the wall. Lets vote Dennis McDonald and Gentile Youd for Commissioners and Howell and Tipton for City Council. All I can say is this whole thing makes me SICK, did when it first appeared and even more so now since no one in authority woke up, and the smiles on their two faces, just unreal, they are laughing at us people. What we have in this county is County Commissioners that are scared to FIRE Coffey. Why you ask, its because Coffey does their job for them and they just rake in the paycheck. When will the people of this county get to task and vote for a county Commissioners with some balls. I realize/understand the Flagler County Board of Commissioners and Mr Coffey represent the entire County, the point is they provide “government services” to those outside the City of Palm Coast, Bunnell and Flagler Beach. The unincorporated area’s of Palm Coast is about 16 %. Just taking the City of Palm Coast the former City Manager Palm Coast City Manager Jim Landon was by far the highest-paid public employee in Palm Coast or Flagler County. When his base salary, perks and other compensation is figured in, and excluding health benefits, Landon was paid $218,296 a year. Hansen and the Board have failed to attract any new viable employers and simply operate spending our tax dollars and grant money to exist. Let’s spend over a million tax dollars on a bike path study for 2.5 mile bike path that has projected costs over 7 million..
Looks like she is playing the system like a fiddle. Annoyed–We know McLaughlin was NOT the answer. All this commissioner did for 8 years is cut ribbons and talk out of both sides of his mouth and run our taxes up and up and up. We don’t know what we are going to get with Mullins until he gets in there and we give him a chance. We know many commissioner drink the Coffey and we know we can and have voted out several and will continue to hold commissioner’s accountable and want them to represent us! This is exactly why Coffey must be fired. We need real change in flagler county. We need all new commissioners. I am not voting for a single incumbent. Why couldn’t Coffey promote from within at a lower payscale? Holding positions for people doesn’t make sense to me. What a insult not to mention the audacious behavior these officials slap on to their constituents. This should be investigated, all Ms Sherman’s credentials, experience, education, the job requirements scrutinized to warrant this padded salary. She retired…then returns the very next next day as a consultant…and we’re suppose to just agree with these decisions. We taxpayers have every right to question and demand answers to decisions affect our bank accounts. Let’s not let this fizzle out as I’m sure Coffey and his cronies are hoping will happen. Once again kudos and thanx to FlaglerLive for their reporting. If not for them we would never know what’s going on locally!! !